The sun has begun its descent behind the wind-kissed sand dunes of Jaisalmer. I twist my right hand around the handlebar and am instantly rewarded with a guttural growl from the magnificent beast on which I am astride. The surge forward pushes a gale force into my chest, arms, all around my neck and the world melts away. All that's left is the open road ahead and a sense of space. It's sweet freedom I feel racing through my blood. In 2000, Royal Enfield was staring at a loss of Rs 20 crore and was on the verge of either selling or shutting down completely. That's when Siddarth Lal asked his father for two years to turn the company around. 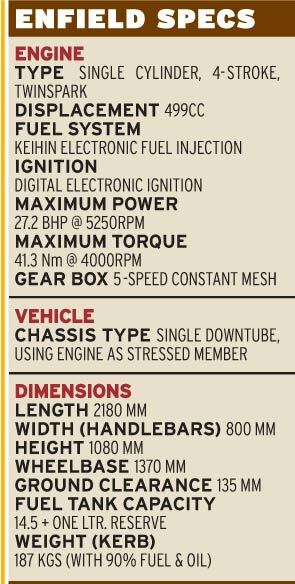 Eleven years later, Royal Enfield is back in serious business. With a re-working of their classic 500CC model and a new 50-acre factory in Chennai, the company is poised to return to its days of glory. 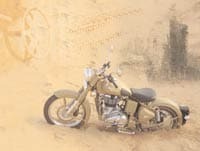 Royal Enfield invited me to take the new Classic Chrome and Desert Storm for a spin through the Thar desert. The updated Classic single-seater brings back the post-war styling, albeit with cuttingedge technology on the frame. The choice to introduce a chrome finish does little to dampen the bike's nostalgic value. The Desert Storm version evokes a military allure with a matte olive-green coat that covers everything, except its TwinSpark engine. The electronic fuel injected TwinSparks are a great addition, kicking out 27.2 bhp. Throughout the ride the engine delivers a strong, crisp sound with a clean throttle response. There's enough torque to touch 120 km/hr effortlessly. The front disk brakes have also been dramatically improved as they now work in tandem with the rear drum brakes for more controlled braking. The front wheel retains the 19 inch rim even as the rear stays at 18 inches. The export models, however feature 18 inch rims on both wheels. The long ride through the dunes also gave me ample opportunities to test rider comfort. Granted, you don't have as many potholed roads to jar your bones, but there's plenty of space on the saddle to keep you snug for the long haul. After a brisk ride, we stop at The Serai, a luxury 'camp' in the dunes, 30 kms from Jaisalmer. Lal, who is currently CEO of Eicher Motors, talks about what's next for Royal Enfield. Their immediate goal is to fulfil the current orders for motorcycles. Royal Enfield's remarkable recovery from the brink could be relegated to a case study in some management textbook. 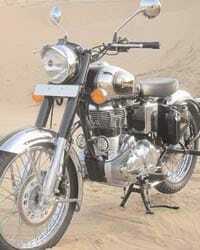 That is, if it wasn't for the iconic motorcycle's manufacturer hold on the imagination of leisure bikers everywhere. As an increasingly affluent India rediscovers the time to pursue its passions, the desire for freedom and the open road beckons. Lal and the team have several plans brewing. These include sharper customer servicing and a wider dealer & marketing network. It's safe to say that the bike 'built like a gun' is aiming for higher ground.